Lazy days on the farm. We have recently changed our beef program around & are going back to a small cow/calf operation with our Hereford cattle. 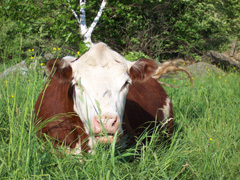 The herefords are known for their grazing ability, tender flavorful beef & even temperaments. We have some wonderful cows in our herd & now that we have downsized & consolidated, we are artificially breeding again with some top bulls in the Hereford breed. We will be selling the calves as feeders at about 7 months old. Currently we have a young bull out with the cows. We have been raising beef since we went out of the dairy business in 1986. We began with a cow/calf operation then after several years began “finishing” them & marketing them for retail. We are now switching back to the cow/calf program to help simplify our lives a bit! 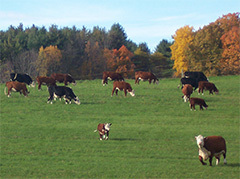 We pride ourselves on the fact that we grow happy, healthy beef animals in a very humane environment.